Stay in Blowing Rock’s premier resort while enjoying all the great Winterfest events, including WinterFeast, the annual Polar Plunge in Chetola Lake, Chili Challenge, Ice Carving competition, bonfires, hayrides and much more! BEST VALUE: STAY 3 NIGHTS AND YOUR 3rd NIGHT IS FREE IN CONDOMINIUMS! Call 828.295.5500 to book now. Two-night stays are required in condos. 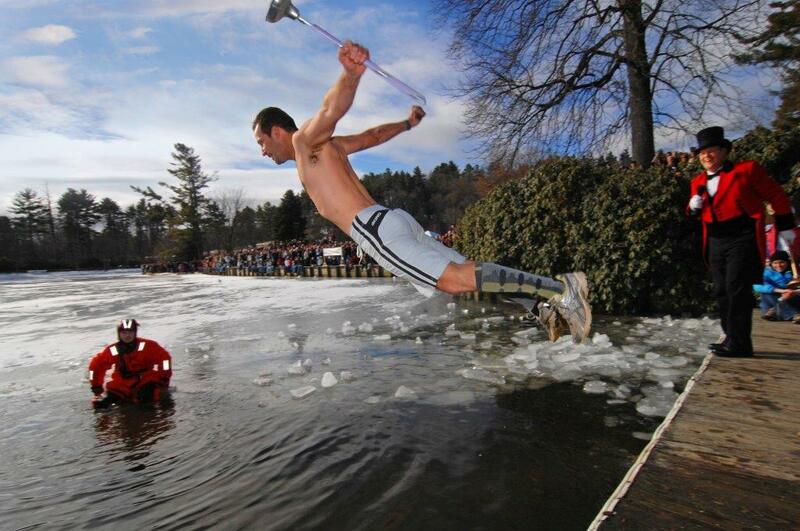 The Polar Plunge in Chetola Lake is one of the highlights of WinterFest. Enjoy the antics of costumed jumpers and the accompanying one liners of Emcee John Carter, WBTV news anchor. Judges will award the famous “Golden Plunger” award to the best costume. Day-of registration and check-in begins at 8am (pre-registration online is encouraged) in the Chetola 2nd Floor Foyer. Plungers gather in the indoor pool area at 9:30am for a safety speech and then the party starts with the annual march to Chetola Lake. Participants begin jumping promptly at 10am, but get there early for good viewing! *50% of net proceeds benefit local charities Western Youth Network and Hospitality House. Last-minute plungers will still be able to sign up the morning of the Polar Plunge in the Boardroom on the 1st Floor of Chetola. Day-of event registration is $40 per person and begins at 8am. Pre-registrants who register by January 4, 2019 will receive a commemorative long-sleeved t-shirt in their chosen size; those registering online between January 5-25 are not guaranteed a t-shirt in their requested size. Pre-registrants will also be entered into a drawing for a complimentary massage at the Spa at Chetola Resort on the day of the plunge! Day-of registrants will have the opportunity to purchase a shirt for an additional $10 at registration; sizes and availability will be first come, first served. Click here to register online - $35 includes long-sleeve tee for pre-registrants. The line to register on the morning of the event is always long. We highly encourage you to register and pay online early, and then all you have to do on the day-of is check in! **Absolutely no one under the influence of drugs or alcohol will be allowed to participate in the plunge. For those who want to watch the frosty outdoor action from the warm indoors of Timberlake's, the Polar Plunge Brunch features a live feed of the Polar Plunge, drink specials and a special brunch buffet.